A lounge. Madonna. A hot tub. Lohan. 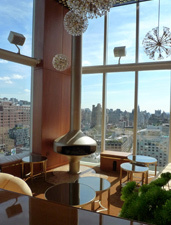 Floor to ceiling windows—in the bathroom—overlooking the city from 18 floors up. And you're…intrigued. But a little visual proof would be nice. Something to confirm that this Shangri-La, this new Studio 54, actually exists. Well, feast your eyes on the first shots of the brand-new Boom Boom Room, a throwback to '70s carefree decadence and the latest fun pit at Andre Balazs's game-changing Standard Hotel, open now for private parties and later this week to the public. From now on, this is where you party—and we mean really party. The space is split into two modern-retro rooms, but you're going to want to start by setting up camp in the main area, filled with wavy cream-colored leather banquettes, golden fireplaces and starburst chandeliers. The other, more intimate room is decked in black tiles and includes a mischievous, triangular hot tub—right smack in the middle of the room. The whole place has the feel of a party lounge Donald Trump would have built on his yacht in 1979, only 18 floors above the Meatpacking District and filled with the likes of Bar Refaeli and Karolina Kurkova.